You’ve decided you’re ready to invest in Business Intelligence (BI) software. And now it’s time to do your due diligence, start researching, and select an analytics platform that fits the comprehensive and unique business requirements of your organization. You have dozens of websites at your fingertips to fuel your business intelligence tools comparision — overflowing with reviews on features, pricing, licensing, and access to support resources—from both BI experts and real business users alike. There’s a lot of information to weed through. And if you’re new to the BI field, navigating these review websites can be an overwhelming undertaking. How important is the number of reviews per vendor? Should you pay attention to the reviewer’s industry? How important is customer support when stacking up the competition? What is a single-stack solution and do you need one? To illustrate how to synthesize these key markers and identify your winning BI solution, we’ll use 2018 Gartner Peer Insights: Reviews for Analytics and Business Intelligence Platforms. But before we dive in, it’s important to note: rankings can shift quickly as new reviews trickle in. For the purposes of illustrating best practices for deciphering reviews, we’re demonstrating on data pulled on January 13, 2019. Should you pay attention to each vendor’s number of reviews? When navigating a sea of similar offers, the number of reviews for a vendor can be a powerful indicator of two important values: a vendor’s commitment to customer success (both overall and per feature). And, in turn, users’ willingness to review. This is a marker that’s crucial to pay attention to throughout your decision-making process, whether you’re considering overall scores as a starting point or comparing “final contender” scores for a particular feature. What can you discern from these vendors based on their scores? Without drilling down into feature scores, use cases, and customer satisfaction scores, just a very general overview. What is more telling and what makes a good starting point for your research is the number of reviews per vendor. In the highly competitive B2B era, trustworthy insights are statistically significant insights. And statistically significant insights are gleaned from datasets that include at least 100 data points (in this case, number of reviews). If the reviews for both vendors (regardless of review volume) strongly support your use case, you may decide that the vendor with more reviews has more experience to support you in that use case. If a vendor with a high volume of reviews doesn’t have many reviews that support your use case, while a vendor with a lower review volume has a considerable number of reviews that do, you may decide to forgo the number of reviews in your consideration. Many of the leading BI vendors have their “secret sauce”—a set of features or a particular capability in which they shine. Now that you’ve oriented yourself with the leaders in the industry, their overall score, and their number of reviews, it’s time to think about your unique use case and how well each vendor is positioned to help you meet your goals. Is your primary goal to streamline internal reporting and implement a BI software that inspires a truly data-driven organizational culture? Or is your goal to provide data and analytics to your customers by embedding a white-labeled analytics platform in your product or software? Or do you need both? What’s more important to you: a cheaper solution that requires an additional budget for in-house data preparation? Or are you willing to pay more for a single-stack solution that covers your full data workflow from ETL to dashboard? Tailoring your research to fit your unique use case is arguably the most important step you can take to make sure you’re choosing the right BI solution. Because comparison websites are designed to compare like attributes—if one solution has a strong back-end and another solution has a strong front-end—it’s in your hands to isolate features and reviews that speak to your highest-priority use cases. For an organization that values self-contained ETL, data storage, and data source connectively most highly (when examining only statistically significant data sets of more than 100 reviews) and comes to the table with an advanced embedded analytics use case, Sisense and Domo should be considered. For an organization that values interactive visual exploration and analytics dashboards above all else and comes to the table with few data sources and a direct analytics use case (no need for embedded analytics or advanced data source connectivity), Tableau, Sisense, and Domo should be considered. While you may choose to lead your search for the perfect BI solution with research into customer satisfaction and willingness to recommend, it can also be used as a handy tie-breaker in a tossup. 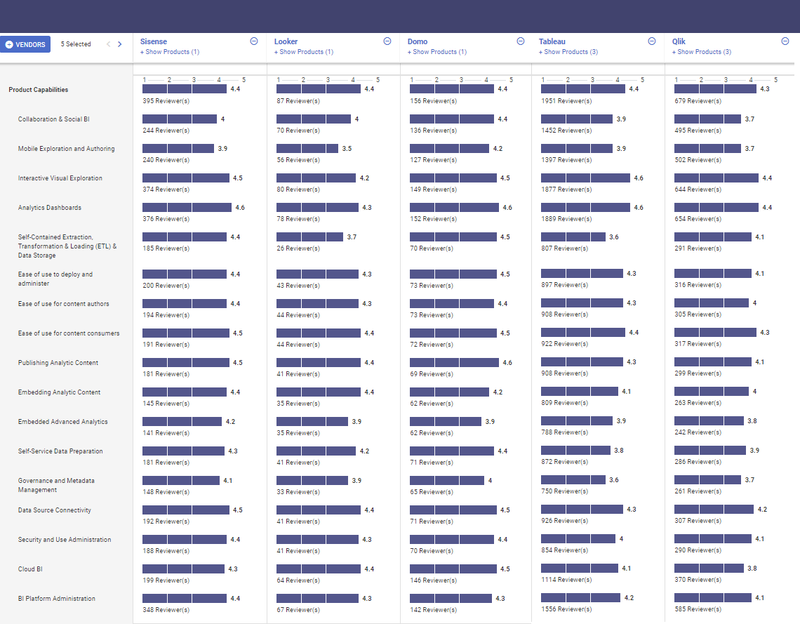 For an organization that highly values advanced data source connectivity, Sisense and Domo are tied in the lead (scroll back up to Table 2 for a look). But with more than double the number of reviews specific to data source connectivity (keep Table 2 handy!) and a slight lead on overall customer willingness to recommend (peek at the numbers in Table 3), Sisense stands out with a clear advantage. While review sites provide a well of insights on the leading BI solutions you should be considering, they don’t do all the work for you. The best way to look at results is to pinpoint the top three features you must have based on your use case, compare leading solutions to identify who is strongest in the features you require, use customer satisfaction scores to break ties or reinforce decisions, and keep the number of customer reviews per overall score and per feature in mind throughout the process. Once you’ve done your due diligence, it’s time to reach out to your top vendors for a POC — on your own data! Because the truth is that even with a fairly common use case, every organization brings a unique set of challenges in terms of data types, data sources, and legacy analytics processes and a POC will be an integral step to determining if your top vendors can handle your data and help you visualize it exactly the way you want it. It’s time to put your top vendors to the test!